Photo published with kind permission of Fred Seggie. 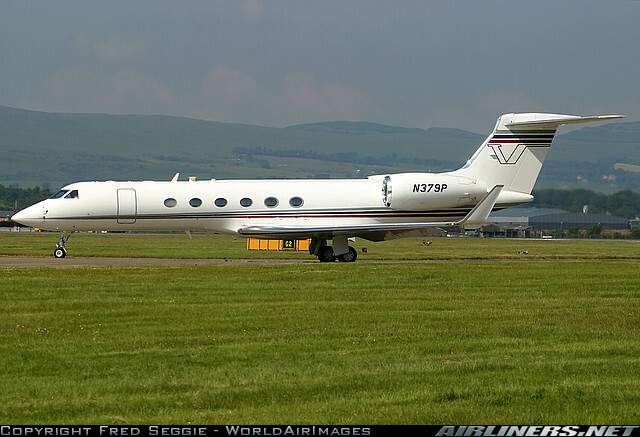 N379P was a CIA-owned Gulfstream V executive jet. It can be linked to 15 rendition circuits between December 2003 and March 2004, often involving the renditions of more than one person, as well as more than one rendition operation per circuit. At the time of each of the renditions involving the aircraft, it was operated by Premier Executive Transport Services, a CIA shell company, and was registered to Aerocontractors, a nominally independent company that worked exclusively for the CIA. The aircraft was re-registered in December 2003 with tail number N8068V, although it continued to be operated by Premier Executive Transport Services. Trip planning services for a number of the renditions carried out using this aircraft were provided be Jeppesen Dataplan, a subsidiary of Boeing Inc. In December 2004, ownership of the aircraft changed and the aircraft was registered as N44982 with Bayard Foreign Marketing LLC. It was re-registered again in January 2006 as N126CH, before being exported to Australia in August that year.